We love our breakfast smoothies around here. In fact if the boys are being a bit naughty at bedtime the thought of maybe not getting a smoothie the next morning is usually enough to settle them down! As I am still off dairy I usually make a smoothie just for me while the boys will have the same as my husband. After trying lots of different milk alternatives I am thrilled to say that my tummy is loving rice milk. I really like the Vitasoy one that is enriched with chickpeas and very high in protein. It is quite sweet (although unsweetened) and a perfect base for a smoothie. 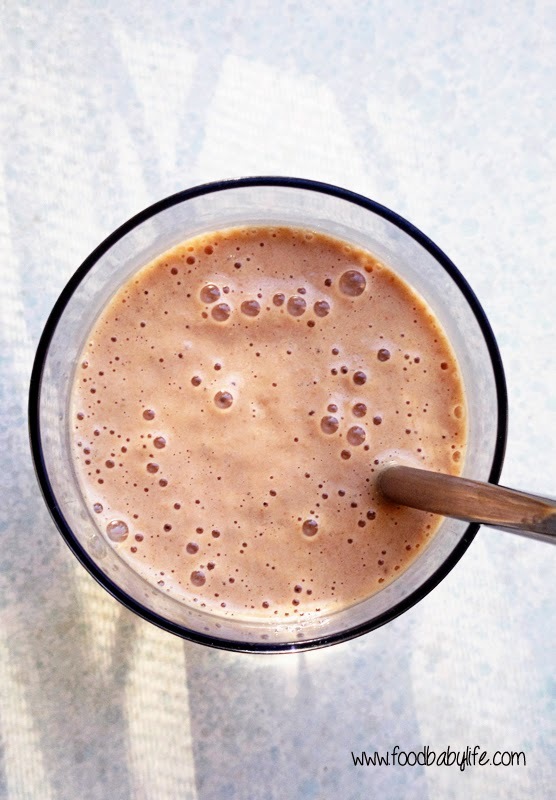 This smoothie is rich and sweet but packed with goodness and is a great start to the day. You won't be hungry for a while after drinking this for breakfast. Place all ingredients in a blender and blend until smooth. Makes 1 (big) serve.